Services Archive - SCS Midwest Inc.
A ceramic-coated, quartz aggregate in a clear polymer matrix, Decorative Quartz floors offer endless combinations of colors. Its long-term durability, seamless application and low maintenance costs make it suitable for a variety of uses from industrial to retail flooring. Slip resistance, color and design can all be customized to the customer’s desire. 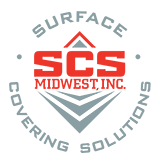 Working with our material suppliers, SCS Midwest Inc. provides a full range of Chemical Resistance and ESD Systems to prevent the transmission of chemicals into your floor and electrostatic discharge. Concrete Staining is a process that adds color and accent to a floor while still allowing the character and attributes of the concrete to shine through. Unlike Epoxy Coating Systems, Concrete Staining penetrates the surface of the slab, effectively dying the top layer of concrete and allowing the color to depict all the idiosyncrasies of your floor’s personality.